Any chances for english version of "The Cuelebre" on blog or other place/magazine? Probably not. The Cuelebre is a legendary Spanish monster and the piece was written specifically for that magazine. Hi, I recently played a Frostgrave game with a friend who increased his wizard Fight stat to +5. As a result this wizard is now better at fighting than a barbarian. Is that intended? Should wizards be capped at +2 fight and focus on the traditional wizard role by increasing health and will stat or be more efficient in spell casting? Hey Guy. Yes, it is intended. If wizards want to focus on fighting, they can. Even with the +5, wizards are still better off avoiding combat - especially with the bigger fighters. Yes, he's now a better fighter than the Barbarian, but only by a very small amount, and loosing your wizard is MUCH worse than loosing your Barbarian. I am from the german Facebook frostgrave Group. In our Group we had and have the discussion what exactly is a Barbarian Berserker and were can we find his stats in the books? Basically, when the game added a specific group called 'Barbarians' in Forgotten Pacts, I needed a way to avoid referring to a figure as a Barbarian Barbarian. (In the same way you might say a Gnoll Barbarian). So I called them Barbarian Beserkers instead. In our last game we could not agree on how falling damage is calculated. Do we subtract the armour from 1.5 × falling height? Hey there, wasn't there a deck of the Frostgrave spells? I'd love that, and I seem to recall there was something like this at one time...? There was, but it's out of print at the moment. The good news - a new version will be coming next year with all the spells from all of the supplements. 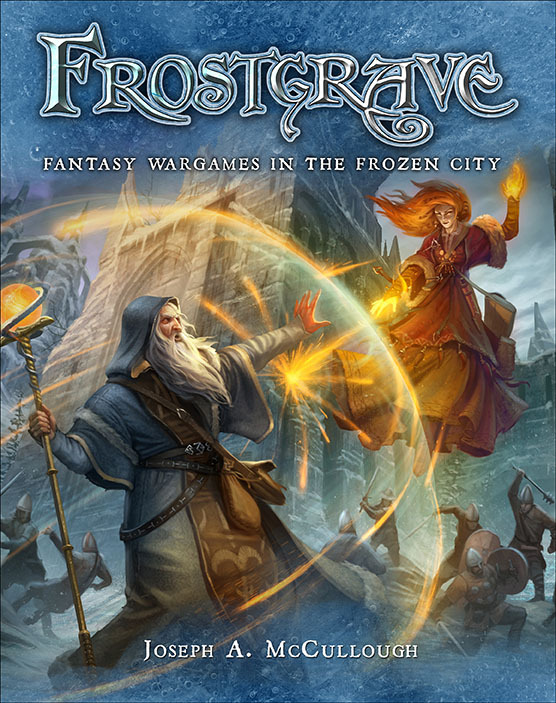 New Version of Frostgrave? That is fantastic! Black powder question... in the 'soldiers' that use the black powder, the -1 to shoot is not included, are we to add it ourselves, or as the soldier is a black powder user, they do not get the -1. These soldiers do receive the -1. You should add it in yourself. You can always get it at RPGNow. Thank you I already got it. can you add your article about "Eye Demons", too? Is there a Frostgrave podcast out there? Why are the links all to a foreign country? The links are mostly to the UK, because that's where I live! I love the Frostgrave and Ghost Archipeligo setting. From a RPG view, is there a plan to produce a map of the world they are set in, or to expand it into a RPG? Not at the moment. But who knows?